IsoTech®, ValvTechnologies’ parallel slide gate (PSG) seat-protected valves, are the culmination of years of practical design enhancements and eliminating the limitations of typically accepted norms in gate valve design. Proven precisely right for steam and feed water isolation applications, IsoTech® valves offer our rigorous four-year, zero-leakage warranty for steam and water applications and low-cost maintainability. IsoTech® valves’ exceptional durability is in large part due to the use of our HVOF RiTech® hard coatings with a RC 70 seat hardness, and are designed for up to ASME/ANSI Class 4500 at 1800°F (982°C). IsoTech®, ValvTechnologies’ PSG valve addresses the need for true in line valve repairability in large diameter, high energy piping systems. Specifically designed for steam and feedwater applications, IsoTech® provides bi-directional, zero-leakage using our exclusive HVOF RiTech® process. Bonnet area. The pressure seal bonnet has been designed with a graphite composite seal. The bonnet has sufficient mechanical bolting to ensure the seal does not relax during periods when the system is not pressurized. In addition to the high reliability of the seal, the bonnet area has been designed to minimize the problems associated with maintenance on large gate valves. 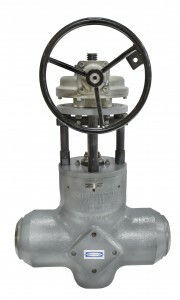 The valve has been designed so that the bonnet does not have to be forced in to the valve bonnet throat to allow for the segment rings to be removed. The large bolting used to ensure that the pressure seal is always loaded has also been utilized to enable simple dissassembly of the bonnet once the easy to extract segment rings have been removed. Gland area. The gland is the same standard design employed throughout ValvTechnologies’ various valve product lines. The stem and gland are hardfaced and polished. The packing has 316 SS woven wire mesh anti-extrusion rings top and bottom and grafoil center ring. This is combined with our proven, superior, multiple Belleville® spring stacks, live loaded stuffing box. The gland design completes the superb proven pedigree of this valve range. Disc and seat area. The valve discs and seats have been overlaid with the same carbide overlay (68-70 RC) as its counterpart, the ValvTechnologies’ metal seated ball valve. These seats are several magnitudes harder than Stellite 6, typically (34-38 RC) and are lapped to achieve a bubble-tight seal under all pressure conditions, including vacuum. The large spring load ensures a high initial seal, and the line pressure increases the sealing. The web guide (which is also carbide overlayed) ensures the discs are kept parallel, whether the valve is in the open or closed position. This overcomes a common gate valve problem. As the valve is cycled under differential pressure, the extremely hard surfaces continually hone and polish each other instead of scratching and galling. The seal is improved rather than degraded with wear/use. Back seat area. The back seat is coated with chrome carbide (typical hardness 68-70 RC) and polished to achieve a bubble tight seal. Designed for ease of maintenance. Benefit: The only requirement is for the disc to be flat against the seat. This is easily accomplished as there are no precise angles to maintain. Pressure seal bonnet has been designed to facilitate easy removal when necessary. Protected seats. Benefit: In the full open position, the flow through “conduit” is positioned precisely between the seats, eliminating turbulence and flow impingements on the seats. There is no gap between our conduit and the valve seat. Small gaps in our competitors’ valves cause extreme turbulence and in come cases cavitation. Self-cleaning. Benefit: Frequent valve usage polishes the surface for less torque and improved sealing. The high spring load insures contact throughout the stroke of the valve and prevents particulates migrating between the disc and seat also helps assist in the honing action. High spring load. Benefit: ValvTechnologies’ very high spring load not only assures contact between the gate and seat, but at all positions from open to close. This allows zero-leakage on hydrogen on vacuum. Parallel discs. Benefit: Unlike conventional designs where the discs are only parallel in the closed position, IsoTech® valves are designed to maintain its parallel discs from both the fully-open to the fully-closed position. Background: A UK plant situated near the town of Selby, England, is the largest, cleanest and most efficient coal burning power station in the United Kingdom. Its generating capacity is 3,960 megawatts and at current output levels generates enough electricity to meet the needs of seven percent of the United Kingdom. This plant, greatly concerned about the environment, focuses on a low-carbon economy, a concept that refers to an economy which has a minimal output of greenhouse gas emissions into the biosphere, but specifically refers to the greenhouse gas, carbon dioxide (CO2). Understanding their very important role in the transition towards a low-carbon economy, this plant is committed to reducing emissions and have various projects ongoing which will deliver significant savings. Requirement: ValvTechnologies’ UK distributor, International Procurement Limited (IPL), specialized in the supply of critical and severe service valve isolation solutions. In 2004, IPL began supplying ValvTechnologies V1-1 metal seated severe service ball valves for problem areas such as drains and bypasses for the power station. Because of the longevity and reliability of the isolation provided on the drains and by-passes, the plant began to use the ValvTechnologies products in other applications in the power station. During 2007 and 2008, IPL supplied a number of 12, 14, 18 and 20” diameter, PSG valves for units one-three on the feed system (start and standby feed pumps, HP heater feed inlet and outlets). These are powerful pumps that can move water at the rate of 150 gallons (568 liters) every second. Solution: The valves proved successful in providing single isolation, which allowed maintenance to be carried out on tube leaks without shutting down the entire system. IPL has since supplied 8” and 10” diameter PSG valves to Drax Power taking the total number of units to 36. The ValvTechnologies’ zero-leakage valve range is the premier solution where isolation is required for critical and severe service applications, providing increased safety and reliability, while reducing emissions, contributing to a cleaner environment. Background: While problems with turbines are rare, routine maintenance and repair is necessary and required. It is essential that the turbine be turned with dry steam. If water gets into the steam (moisture carry-over) rapid impingement and erosion of the blades occurs. This can lead to imbalance and catastrophic failure. Any imbalance of a rotor can cause vibration requiring the turbine to be isolated and shut down immediately. In the event a turbine requires maintenance or immediate repair, it is essential to have high-quality, reliable valves for the turbine to be isolated. Failure to completely isolate a turbine can result in a complete or partial plant shutdown, causing safety concerns and increased maintenance costs. Requirement: A chemical plant in the southern United States was experiencing moisture carry-over into their turbine. The turbine isolation valves were 20“ wedge gate valves with a six inch bleed valve. This particular chemical plant has its own power and steam system. It has several boilers that discharge into a steam header and then the steam header furnishes steam for the plant to use and also delivers steam to the turbines. This system design allows a turbine to be isolated and removed from service for maintenance while not effecting operation of the plant. The turbines were designed with a double block-and-bleed valve assembly to ensure that the turbines could be isolated. When closed, the wedge gate valves leaked so severely that steam passed through the valves and into the turbine. The leak made it impossible to perform turbine maintenance repair and the plant would have to be completely shut down so that the turbines could be accessed. With each occurrence, the cost associated with shutting down the plant was several million dollars per shut down. Solution: To solve this problem, ValvTechnologies furnished two, 20” PSG valves with a 6” bleed valve and the associated bypass valves. These valves were welded together in an assembly that measured 20’ in length from end-to-end. The client requested this assembly so the installation could be expedited and the total plant shut down time was kept to a minimum. The two PSG and the associated assembly were installed in March of 2004 and the valves have operated numerous times since installation and continue to isolate. The PSG addresses the need for true in-line reparability in large diameter, high-energy piping systems. Specifically designed for steam and feedwater applications, the PSG provides bidirectional, zero-leakage operation for reduced downtime and maintenance costs as well as increased reliability and efficiency. Background: The plant had two main steam isolation parallel slide gate valves (PSG’s) installed in this application. Design pressure and temperature for the application is 2350 psig at 1050°F (162 bar at 566°C). They were experiencing severe leakage when valves were required to isolate. From initial plant start-up, the frequency of valve maintenance of up to twice per year per valve. The cost of $40,000 per repair, was a particular concern for the plant. These repairs were strictly limited to disassembly, cleaning and visual inspection, grinding the seats and discs and reassembly. Well before the plant anticipated they were faced with having to replace valve seat rings and discs. The plant management decided to look at their alternatives for an upcoming outage. Requirement: The plant installed two 12” 2500# C12A ValvTechnologies’ IsoTech® parallel slide gate valves during their spring 2014 outage. The IsoTech® valve was the perfect remedy, as it utilizes a RiTech® chrome carbide hardcoating on the disc and seats, providing a more robust, stable sealing surface at elevated temperatures.The IsoTech® valve is a through-conduit, position-seated design, which protects the valve seats from the flow stream, resulting in a valve that provides zero-leakage and requires zero-maintenance. ValvTechnologies is so confident in its ability to withstand demands of steam isolation, that they back the valve with a four-year performance warranty. Solution: The valves have been installed and in-service for over two years and have experienced over 270 cycles with zero maintenance required. The valve’s ability to provide zero-leakage has resulted in drastically reduced downtime, which combined with the maintenance cost savings, has presented a two-year return on investment (ROI) on the original purchase/installation cost. Severe service isolation valve leakage significantly reduces a plant’s heat rate performance, because millions of BTU’s leak away through hundreds of valves, and never reach the turbine. With ValvTechnologies’ zero-leakage severe service isolation valves, less fuel is burned to produce megawatt’s, which leads to lower emissions ultimately lowering costs. Turbine isolation and the parallel slide gate valve. Steam turbine damage by water induction is a costly economic, safety and major reliability concern. It is essential to have high quality reliable valves to isolate a turbine. ValvTechnologies’ IsoTech® parallel slide gate valve (PSG) addresses the need for true in-line repairability in large diameter, high-energy piping systems specifically designed for steam and feedwater applications. An alert concerning Alloy 6 liberation came from GE Energy, which issued Technical Information Letter 1626 on January 30, 2009. It advised steam-turbine owners to check the condition of the Alloy 6 inlay sections used in fabricating seats for the OEM’s combined stop and control valves. Guidelines and Specifications for High-Reliability Fossil Power Plants, 2nd Edition “Best Practice Guideline for Manufacturing and Construction of Grade 91 Steel Components”, was introduced in June 2015 by The Electric Power Research Institute (EPRI). SOLUTION: ValvTechnologies’ IsoTech® parallel slide gate valves are built specifically for modern-day severe service power applications where temperatures exceed 1000˚F (538˚C). Our RiTech® 31 hardcoating technology is impervious to the effects of high temperature cycling typically seen in combined cycle power plants in main steam isolation and hot reheat applications. ValvTechnologies guarantees that our IsoTech® parallel slide gate valve, provided with our recommended RiTech® 31 hardcoating for use in high-pressure and temperature, super-critical and ultra-super critical applications, will not delaminate for 10 years or 10,000 cycles – whichever comes first. REMEDY:In the unlikely event the RiTech® 31 hardcoating delaminates from the substrate as described above, ValvTechnologies will provide the necessary labor, supervision and tooling to replace the defective components limited to the discs (2) and seat rings (2), either in situ or in a controlled shop environment. This guarantee is in addition to our standard Four Year, Zero-Leakage warranty. ValvTechnologies makes no warranty of any kind whatsoever, expressed or implied, other than as specifically stated herein. Standard four-year, zero-leakage warranty in steam and water applications available in addition to the ValvTechnologies’ Delamination Guarantee.